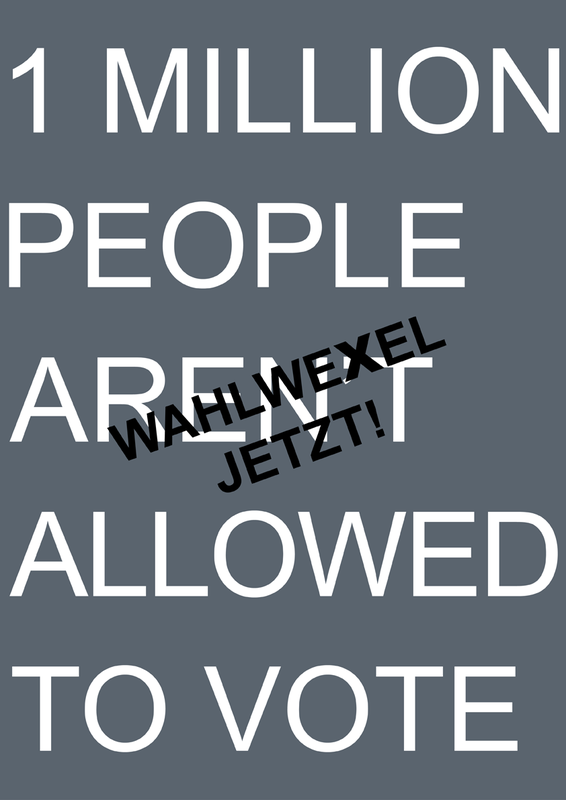 I am participating in WahlweXel jetzt! WahlweXel ‘now for real’ is a collective act of protest and a democratic experiment. Anyone should be able to participate in the way they feel comfortable with. No one should feel surveilled or forced to do anything. This is why we propose four possibilities for the concrete situation. A person that’s eligible to vote looks for and finds one that’s not eligible, in advance. Both come to the event together and jointly take up their decision of what, how and if to vote. That’s the most simple option, based on which you don’t have to discuss much on the 25th. It’s still worth coming along though, since our collective protest will grow with each person that participates, and with every envelope who joins our walk to the mailbox. A person that’s ineligible to vote sets out to find someone with a vote, at the event. Together they discuss what the latter person should fill into the card. This can take some time - we have 30 minutes. Finding a match is something mutual of course, so nobody has to discuss with a person they’d rather not vote with. The person eligible to vote can also decide to just follow the suggestion of the non-eligible person for voting and simply fill that into the card. Should no consensus be reached that’s no big deal. In that case you can invent another solution together, vote blank or meet again. The chief principle here is mutual respect. A mixed group made up of people eligible and people ineligible to vote decides to try out a small assembly situation. Groups should be made up of 4 to 7 persons, of which about half should be persons with poll cards. Together they discuss what should happen to the poll cards – to either cast their vote for a party, split up the votes or vote blank. If no consensus can be found on the matter, it might be best to divide up the votes. The point is not that one person gets their opinion through but that you reach a solution that’s okay for everyone. Here too we recommend a group size of between 4 and 7 persons. And here too it’s important that no one feels forced to participate in a specific group, but can choose. If a group doesn’t reach consensus, there should be the possibility to come up with an alternative solution, postpone the decision or divide up the votes. It’ll be a dense space and so those who’ve already voted should move to the outside area in order not to disturb the decision making processes. The initiators of Wahlwexel will not be available as referees – it’s down to the pairs and groups to find solutions. The only thing that can certainly be tricky for everyone is the very act of making a cross on the poll card. Both the person eligible and the person ineligible can get into legal trouble if their joint poll card is filled in by someone other than the one whose identity it is linked to. This is why we recommend that the cross is EXCLUSIVELY made by those who bring the poll card. If you decide to do otherwise it’s at your own responsibility and risk, we won’t check. We will supply a small cross-making area for legal safety, shielded from vision. We will ensure that there’s no press present during the electoral process and that no photographs whatsoever are taken by anyone else. The most visible part of our action will be walking to the nearest mailbox in Nussdorferstrasse together, where we deposit the filled-in poll cards. We’ll wait for all pairs and groups to decide and proceed to the mailbox together, as a kind of unregistered demonstration, celebrating our act of empowerment and the fact of having transcended the division between people who do and who don’t have the right to vote. Then we’ll return to WUK and celebrate the evening with music and karaoke. 1) Are you for a right to vote for all including non-citizens after 1 or 3 or 5 years of residency? 2) Are you for a legal entitlement to Austrian citizenship without any further requirements after a 1 or 3 or 5 years of residency? 3) Are you for a general ban on deportations? What is your answer to these questions? The debate is open.